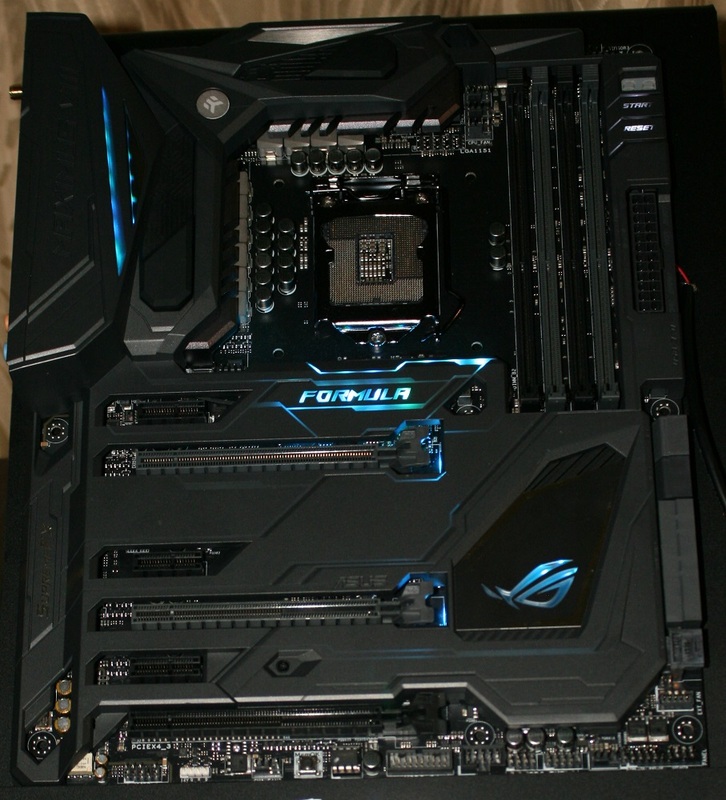 Our next stop in covering CES 2016 was with the fine people at ASUS. Raja lead us around their suite showing off all kinds of new goodies from the new Z170 Maximus VIII Formula, 970 Pro Gaming/Aura AMD board, gaming peripherals and even an external graphics docking station, the ROG XG Station 2. The MVIIIF, as I will now call it, is a Z170 ATX motherboard sporting a integrated EK made waterblock to keep the VRMs cool. 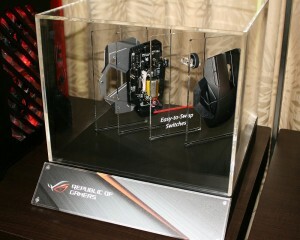 ASUS mentioned that in their testing, liquid cooling dropped the temperatures on the VRMs by up to 23 °C. It also uses the new Aura lighting so you can customize the LEDs that are placed in various places on the board. The board is theme-agnostic in its black PCB and dark grey armor (think Sabertooth armor). With the ability to customize the LEDs’ color with full RGB to choose from, it will fit with nearly every build. You can also connect LEDs to the motherboard and control them through the software. Expect to see this motherboard on the shelves in a couple of weeks, as well as a review! 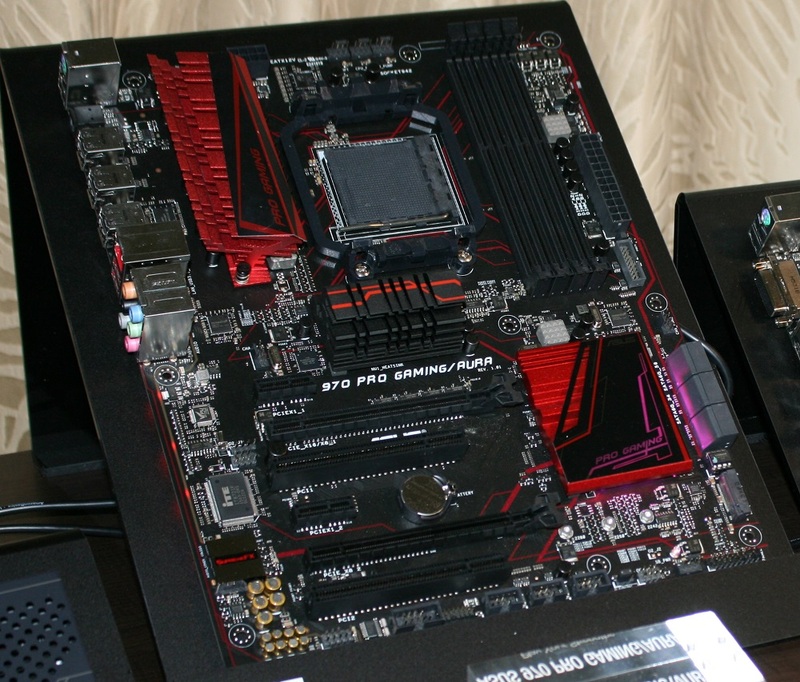 ASUS took the liberty of modifying an older but solid chipset (970+SB950) for AMD CPUs. One of the first things they did was to jazz it up a bit with some RGB LEDs that are fully customizable with their Aura software. They added M.2 NVMe support as well (just below the southbridge) so you can use one of these quick SSDs on the older chipset. 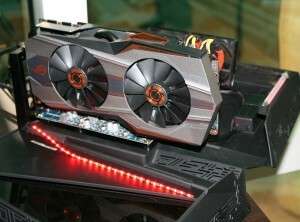 Last, but not least, this is the world’s first AMD board that is certified by NVIDIA to offer SLI support. One of the next items we looked at is the soon to be released ROG Spatha wired/wireless gaming mouse. 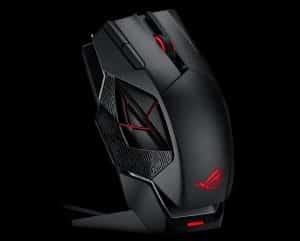 The mouse features an 8200 DPI laser, and 12 programmable buttons (six by the thumb) made for “MMO glory.” It comes with a vertical charging stand, or the ability to plug it in and use it wired. If the feel of the left and right mouse button are not what you would like them to be, the ROG Spatha also has the capability to easily replace the switches. Look for this in the market soon. The ROG Claymore Mechanical Gaming Keyboard, pictured below (from ASUS website), is made out of aluminum with a cool looking design, uses Cherry MX RGB mechanical switches, and also has a detachable number pad that can be placed on either side of the board. That same number pad also has macro switches on it. 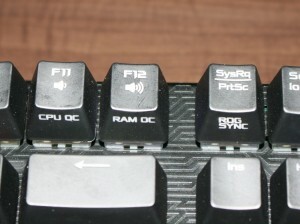 The keyboard features full customization via Aura software, N-key rollover and it can be synced with ROG motherboards to control fan speeds, direct to BIOS boot, overclocking (profiles) via buttons on the keyboard (see photo below). One of the last things we had a chance to see was an external graphics docking station named ROG XG2. 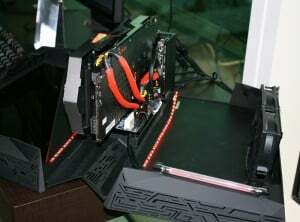 This neat device is intended to boost up your the graphics power of your laptop by using the GPU inside of this device, instead of the typically weaker ones inside of most laptops. 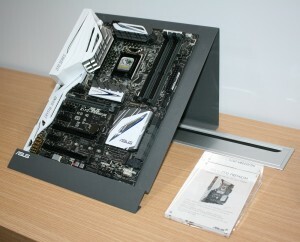 The dock will support any card, NVIDIA or AMD based. As you can see from the images, it will fit a large card as well as the ROG Matrix 980 Ti manages to fit inside. This will also charge your laptop when it is docked. 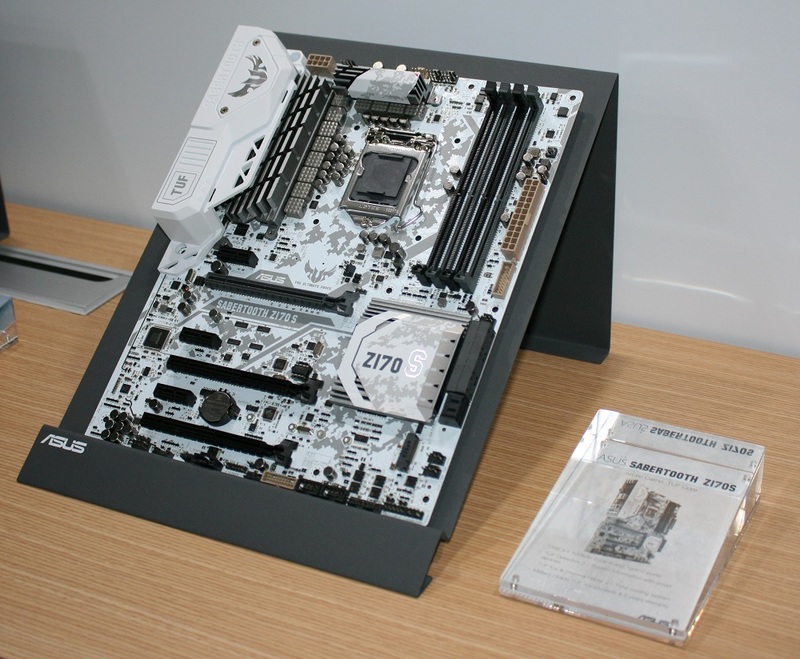 Also on display was the Z170 Premium motherboard, intended to slide in above the Deluxe in the product stack, as well as a slightly different version of the venerable Z170 Sabertooth Mark 1, named the Z170S Sabertooth. The big differences, outside of the lack of armor, is the camouflage theme. We should see these on the market shortly as well. We have a couple more partners to cover, keep an eye on the front page! Wow that Sabertooth s board looks amazing! Great write up. 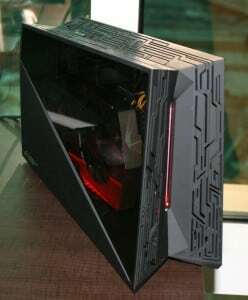 I would really like to see a write up on that GPU docking station. Historically the drop in performance has been hard to swallow for the price. So nice shiny things in there for the wish list though.